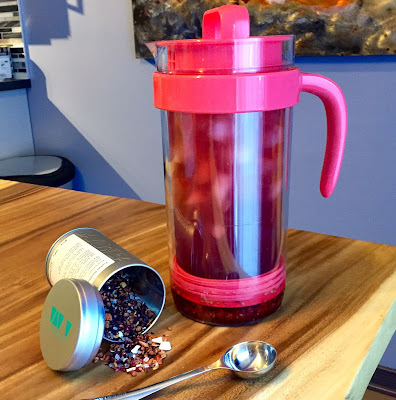 It's no secret that I'm a huge fan of iced tea and that David's Tea is my go-to for loose-leaf tea. I've been using their single iced tea presses for a few years now but was ecstatic when they came out with the big pitcher! My fiancé loves drinking juice and I'm trying to switch him over to tea (way less sugar!). I managed to drag him to the store one day and it so happened the iced tea pitcher was half off... It was an easy sell! He said that as long as there is iced tea ready to go in the fridge, that's what he'll drink. Deal! I've made 4 batches in two weeks so far. I think we'll need to stock up on more flavours! It has finally arrived! The long-anticipated Anniversay Sale is upon us! I got to shop the first day of Early Access and made away like a bandit! I had been preparing for the sale and had been saving up because it's so worth it! I had even booked an appointment with a stylist and sent in my wishlist so he could have a change room stocked with items for me to try on. This is totally the way to go and takes some of the stress out of shopping. 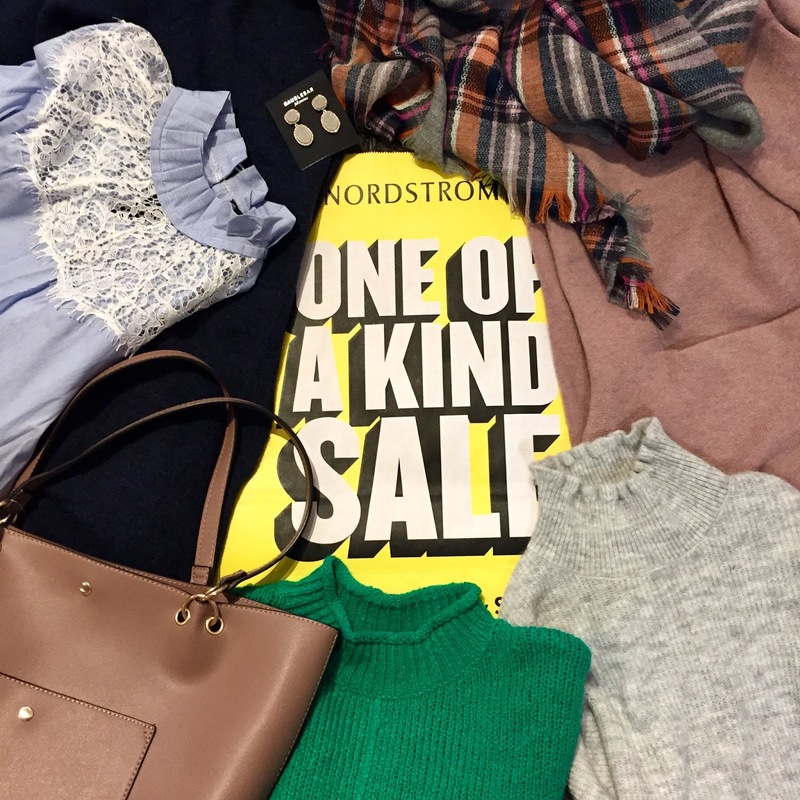 As usual, I stocked up on sweaters and cardigans. I also found this super cute preppy/Victorian feel blouse! I also picked up a few fall accessories. A tote, a blanket scarf and statement earrings are the perfect finishing touches to any practical fall look! 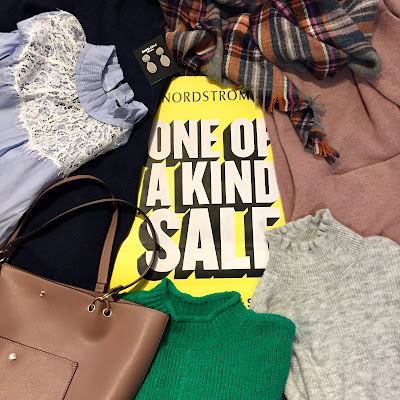 Shop my Nsale picks below! 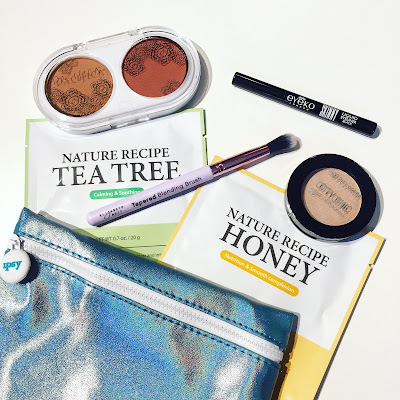 This month's glambag was a bit ho-hum to me at first, but I actually loved everything about it when I tried the products! First off, the pouch itself is super shiny and perfect for throwing in your beach bag to keep those little bits and bobs together. The finish sort of reminds me of shimmering pool water, so a really summery accessory! The eyeshadow is a very nice neutral, but with a little shimmer. It's perfect for a low-key look and blends extra well with the new blending brush I got. I also love a good liquid liner and this one is pretty good. Goes on smoothly enough. I just find the small size harder to hold. The longer tubes are definitely easier for me. I think my favourite product is the blush duo! I love both shades, either together or individually. They are very pigmented so a little goes a long way! Plus, it's nice to have one compact with a couple options, makes it great for travelling! Finally, I got another set of sheet masks. To be honest, I'm over them. None has ever stood out to me, they are all the same. Nothing wrong with them, just over the hype. When you walk into J. Crew, and there's a sale, you walk out with this little beauty! 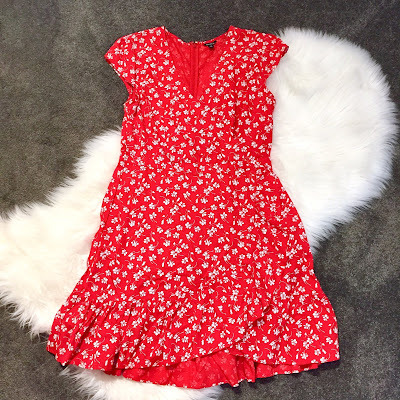 I can't get enough of this little wrap dress' ruffles and daisy print. It's quintessentially summer and is both feminine and casual. It's also got that slight preppy side to it. I plan on wearing it with a straw hat and espadrilles or a jeans jacket and white sneakers. I can even get creative with layering and wear it into Fall. A little red dress is the perfect statement piece and just downright fun to wear! So, I was just scrolling along on Instagram the other day (as one does), and stumbled upon this announcement. I was so surprised I almost dropped my phone! 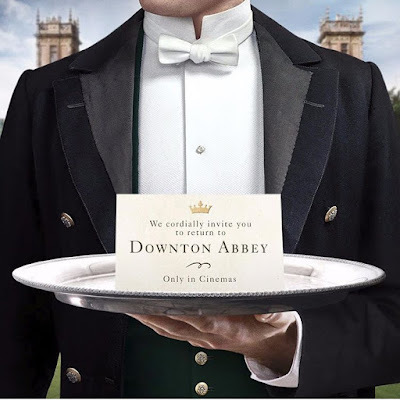 There will be a Downton Abbey movie?!? I am over the moon about this! Downton has been (dare I say it) my all-time favourite TV series! I was riding the Downton train since the second season, way before it became all the rage on this side of the pond. I remember reading a small blurb about it in the Maclean's and decided to look it up. When talking about it with my brother (huge history buff), he suggested I watch the Gosford Park movie, as it sounded very similar to the series I was describing. Well, his suggestion was right on the money and I really enjoyed that movie. However, I am most definitely looking forward to watching this gem when it comes out! I cannot wait for the Dowager's witty one-liners!